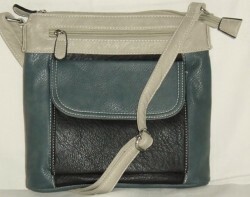 Our faux leather style Olivia has an adjustable shoulder strap, it can be worn over the body if desired. It has one top zipped opening main compartment, with an inner zip pocket and two open pouch pockets. A front pocket with stud fastening, and one front zipped pocket.